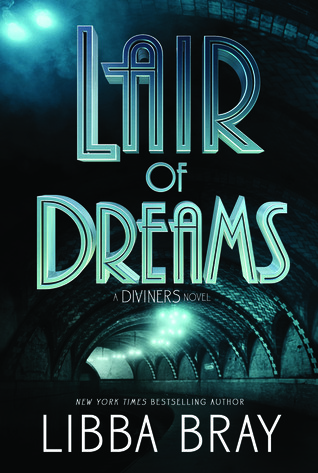 Lair of Dreams was even better than the first book in The Diviners series. I don’t think I’ve ever written those words before. Very rarely do I find myself falling in love with the second book in a series, even when a series is four books long like this one. Second books are always just dull to me since we know the characters. Libba Bray made me eat my words. She crafted a world even more intricate and magical than the first book. A book that left me breathless and wanting more from The Diviners series. New characters are introduced and the cliffhanger this book leaves on? Wow. I am still reeling. By the time this review goes live (hello folks, I read this book in August) I will have probably finishing the third book in this series and be anxiously awaiting the release of the final book. However, for now, I am just so blown away. I listened to this book over the period of around 10 days. I listened every time I took my dog for a walk and I can’t say that I took him every day due to my arthritis medication making my body hurt more. However, I found myself taking my dog for longer walks just so I didn’t have to stop listening. I am still so new to this audiobook game but it is so fun! My complaint when I first started was that I can read faster than the people speaking. So, it’s 2x speed for me at all times. I still read a book a lot faster physically but it is so nice to be able to read and walk. Anyway, more about the Lair of Dreams. The second book in The Diviners series follows the same characters as the first, with an extra one thrown in for good measure. It takes the same setting, New York in the 1920’s. The characters all coming together with there individual stories. I think the best part about this book was finally having all the characters meet each other in one group setting. So many of the relationships between characters have been duos, making it difficult for all the information to be shared between characters. However, the events of Lair of Dreams means that Libba Bray had to bring all her characters together. She does it so well as well. The characters all have their voice and no one gets lost throughout the story. There is such a unique struggle with identity throughout this book. With almost every character being diverse in some way or simply struggling with their divine powers. In a time where being unique wasn’t accepted, unless you were white and rich, it is easy to see why so many struggles arise. Truly, there is so much story that goes into Lair of Dreams that the 600 pages this story is told over are not nearly enough to capture it all. I don’t think I’ve ever said those words either. Libba Bray has truly changed my outlook on so many things. I mentioned in my review for The Diviners that I didn’t like the idea that a love triangle was forming throughout the book. Lair of Dreams puts that triangle to rest pretty quickly, and unfortunately, it was not with the guy I liked. Which made me a bit sad, but I could definitely feel the chemistry between Sam and Evie throughout the book. I say that incredibly begrudgingly, I hope you know. I am not good at swapping my ships over once they are set in place. I really think Libba Bray perfectly interweaves the story of diversity into this world. There are so many marginalised voices throughout the story and each one is given their moment in the spotlight. All of these voices were ones that would have been silenced in the era this book is set. There is such a solidarity between these characters that it is amazing. I think my only complaint is there wasn’t more Theta. She is truly my favourite character in this series and with the way this book ended I’m sure we will be seeing a lot more of her in the third. Overall, I’m going to end my review here. Not because I don’t have anything to say but because I have too much to say and I truly don’t want to spoil anyone. This story deserves to be picked up by everyone. It truly has a little something for every person. Unlike the Diviners, Lair of Dreams is definitely not as scary. It is spooky more so, but definitely lacks the gruesome factor that The Diviners had. I’m so excited whenever I see someone enjoying this series as much as I have! Isn’t it incredible how Bray just totally goes above and beyond all expectations? I’m so in love with this series. And hey, if you still haven’t read Before the Devil Breaks You yet, never fear: there’s SO MUCH THETA (she’s my fave too ❤).